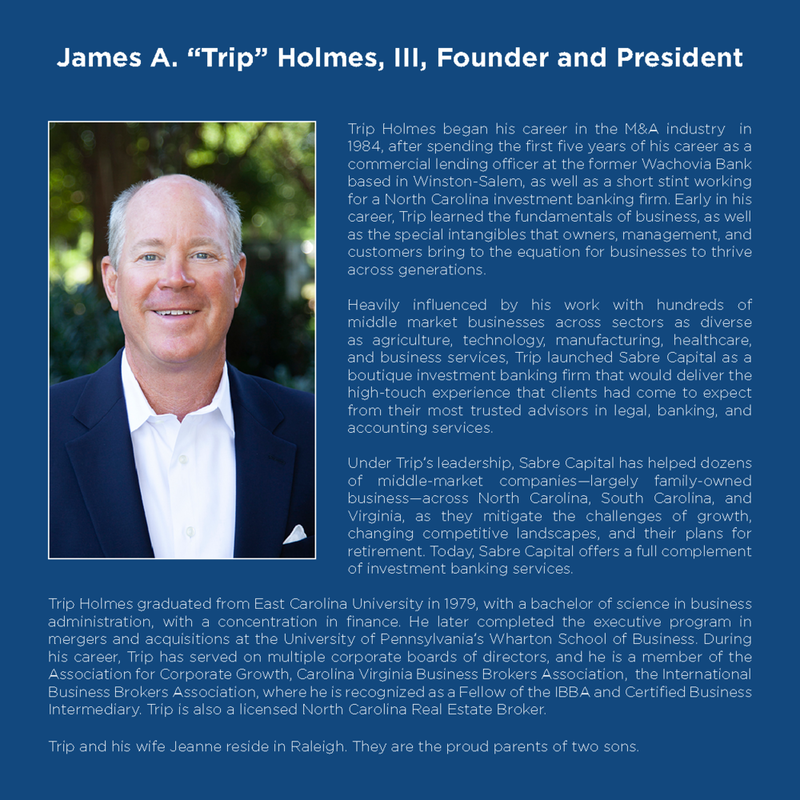 Since 1984, Sabre Capital has served middle-market companies across the Carolinas and Virginia, as they navigate challenges related to growth, competition, and transition. Our services include both consulting and investment banking services to the owners of privately-held companies. We advise on multiple strategies, including mergers, acquisitions, and divestitures, to enhance the value of businesses to owners, managers, and employees. Fundamental to our approach is our emphasis on the confidential nature of our work. To provide the highest standards of integrity and individual attention for each client, while formulating and executing a solution that exceeds their expectations. Our experience in advising middle-market companies spans nearly four decades, with our counsel financially-based. We engage the marketplace aggressively to assure fair valuations, structure, and timing of transactions that are integral to the mutual success of Sabre Captial and its clients. Our high-touch approach especially benefits clients with regard to our intermediary services with buyers, sellers, banks, lawyers, accountants, and search consultants, as we build understanding among each of these constituencies while keeping our clients’ interests first. The nature of our business, as our clients conduct due diligence and explore their options, must be confidential, so as not to disturb the day-to-day operations of their companies or impair their employees, vendors and customers in any way. We take extraordinary care in both our objectivity and sensitivity to personal and personnel-related business issues. To this end, we preserve the confidential nature of our work, from the initial consultation to post-transaction. When you engage Sabre Capital, you have the advantage gained from experienced, personal service with an economy and flexibility simply unavailable at larger brokerage and consulting firms. Our compensation structures are equitable and project-driven to ensure success. When we present our capabilities, you can see we operate with full confidence that we can make solutions happen!